Chicken can get a little old after a while; my husband accuses me of making chicken, rice and beans every, single, day. This is totally not true, but he’s right that sometimes chicken can be a little monotonous. To spice it up, try this simple crusted dish. Crusted chicken is a family-friendly comfort food that will win over everyone at your table, and done right, doesn’t have to be terrible for you. 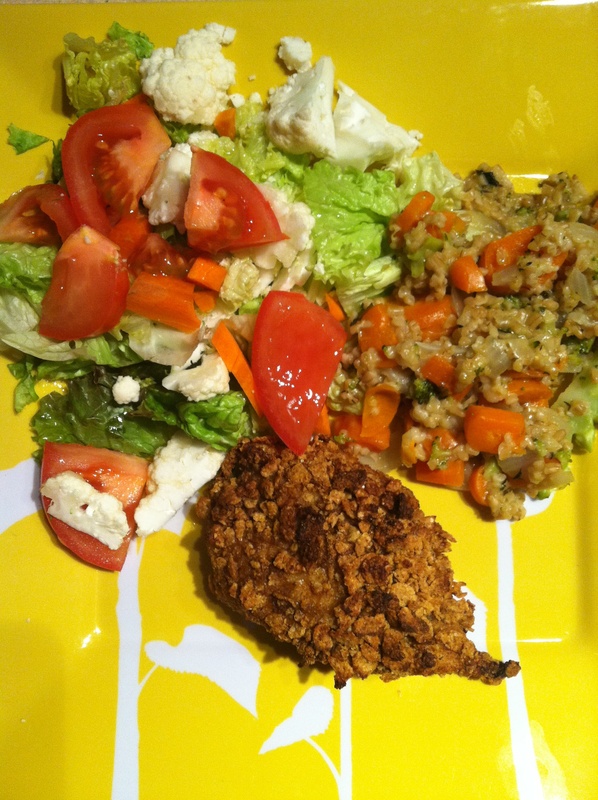 Here’s a perfectly balanced meal on Slimware Portion Plates; Crusted Baked Chicken with Oat Risotto and a simple salad. For all you vegetarians out there, I think you could make this with firm tofu instead of chicken. Try it and let me know! My best friend’s daughter is allergic to dairy, and I know she is patiently waiting for this recipe, so with her in mind I set out to see if you could make a non-dairy buttermilk. I found a recipe that uses a non-dairy milk alternative mixed with lemon juice, apple cider vinegar or cream of tartar. So, anyone with a dairy allergy or eating vegan, let me know how that buttermilk substitution works out. Place chicken in the buttermilk and store in an airtight glass container to marinate overnight. Make seasoned crumbs out of the cereal and Old Bay in a blender or food processor; transfer crumbs to a large bowl (this can be done in advance or in bulk; store crumbs in the fridge or freezer). Place a cooling rack on top of a baking sheet. 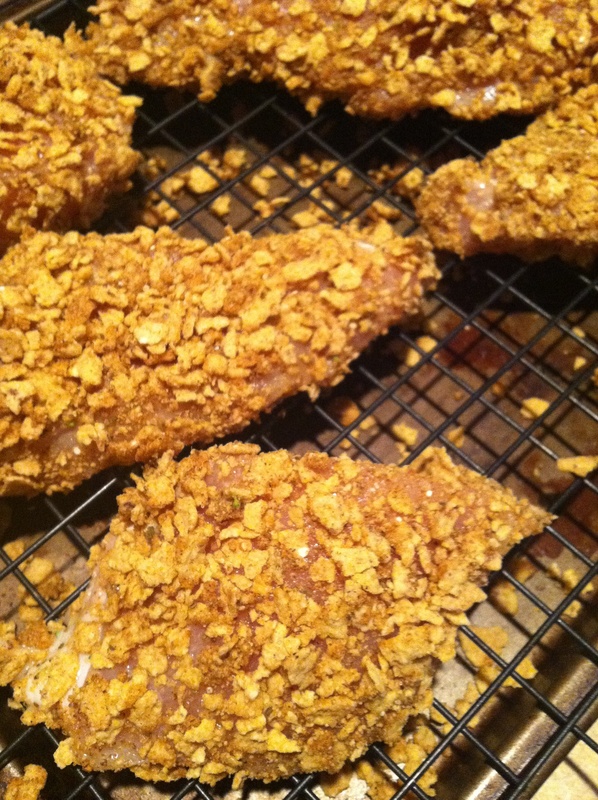 Remove the chicken from buttermilk; let the milk drip off and then dip the chicken pieces into the seasoned crumbs; mix around until the chicken is well-coated and then place on the rack. Spray chicken with cooking spray. Bake 35-40 minutes until chicken is cooked through (poke chicken with a fork and the juices should be clear). I struggle to get the crust to “stick” to the chicken, so I bake the chicken on a cooling rack rather than on a baking sheet where you lose half the crust of the chicken.